Road Trip – What A Day! Whew – we drove 2 hours down to Pueblo to meet the person responsible for rescuing Gracie from a puppy mill and getting her into our arms. 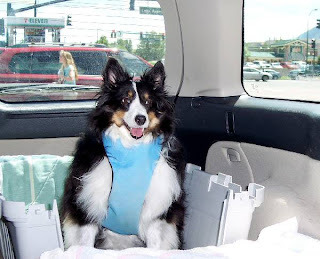 Gracie didn't want to miss a minute of the ride, so she sat there on high alert the whole way. 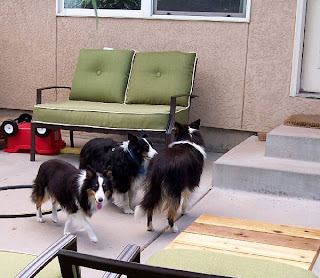 At the headquarters for the Pueblo Collie Sheltie Rescue, we met Hope and some other dedicated dog lovers, plus lots of dogs. We were there to see Teddy and to find out if he would be a match for us. 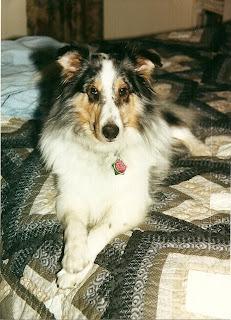 He is a magnificent dog – we are giving him careful consideration. Mom was very impressed with how Grace interacted with the other dogs and she almost looked like a leader to 2 of the latest puppy mill rescue dogs. They were scared little girls and reminded us a little of Grace, although Grace wasn't quite as frightened as they are. She was even brave enough to go sit between Mom and Dad on the grass – her first time to do that. 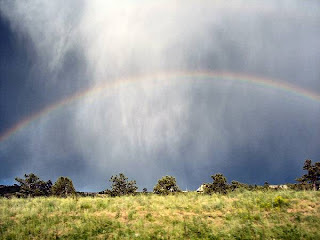 On the way home, we saw a rainbow. 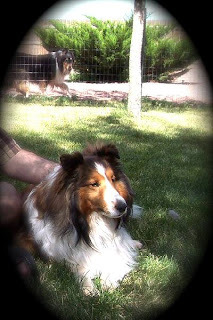 Maybe my buddy River was saying "Hi" and she approved from the other side of the Rainbow bridge. 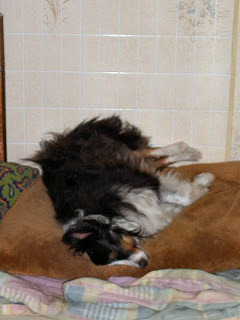 It was such a big day, Mom got a picture of me soundly snoozing in my bed this morning. I didn't even hear her sneak in. We had a really good time. River passed away today and we are all very sad. 5 days later... we really miss you River girl. your animal friend with smiles instead of tears. left a rainbow in your heart.